Help > Backup/Maintenance > How to backup library databases? Help > Options > How to backup library databases? It is recommended that you back up your data on a regular basis e.g. once a week or once a month. 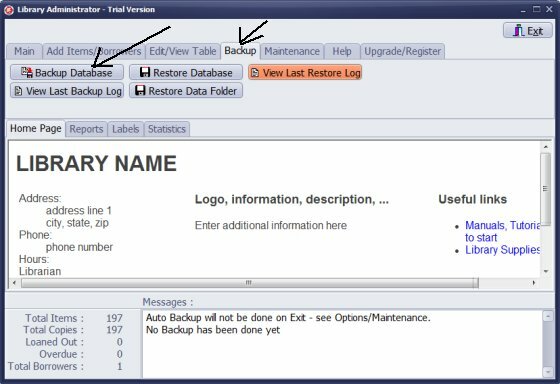 You should especially do a backup after entering new records, adding new report or label definitions, changing application options, moving library database and application settings to a new computer. When you use Backup function all essential data files for the currently selected database are compressed and stored in a selected backup folder. If you have more than one library database you have to Load each database and then back it up. On the Backup tab click Backup Database. Backup application is executed. This Window opens and closes automatically. 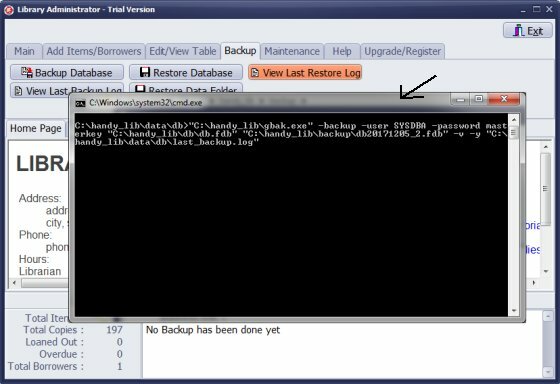 The backup log window opens automatically. Click Close to finish. Additionally you can copy or move your library backup files to an external hard drive (hard disk, DVD, CD, or USB memory card). Run Backup Database on an old computer. Move two files to the corresponding backup folder on a new computer. 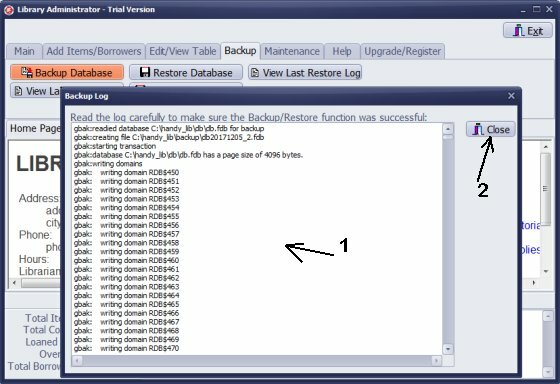 Run Restore Database and Restore Data Folder. 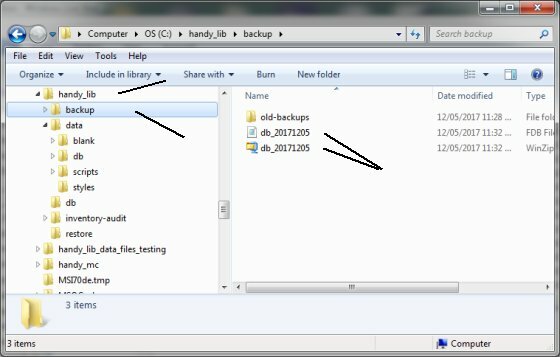 How to define backup folder? How to set auto backup on exit? I have the auto backup setup for when I close the software. However, it is very cumbersome to get the backup file actually backed up off the laptop. Is there an easy way to backup my library database to a USB drive? Answer: You can change the backup folder in the Options window. I have a question regarding backup then transferring information to a second computer. First I backup the library data base but then I cannot find it on C drive with the current backup date. I would then like to copy the backup on to an external hard drive ready to restore on our second computer. Can you please direct me to the help file for this question? Answer: Review this topic and then how to restore library backup file. Hi I am just wondering, if I purchase a new Laptop for the Library, (or my current Laptop fails) how can I put my Handy Library software on a new device? Is there a way I can back-up my information on to a separate USB or hard drive in case of computer failure? Could the Handy Library Manager software be moved from computer to computer if need be? Answer: Review this topic how to create a backup file then review how to restore library backup file. It is a very good idea to keep your backup file at two different storage media. You can move the library backup file to your flash drive (USB). My old PC is no longer running well enough and I am purchasing an updated unit running Windows 10, what steps do I need to follow to continue using this program? Answer: Do you want to upgrade to the newest version? Iinstall the software on your new computer and use backup and restore procedures. I don't see anything that explains how to back up my database. How do I make sure I don't lose data I've entered? Is that a daily function? Do you have a PDF explanation of that? Answer: Please review instructions on this page, read how to: export your library catalogue data to a spreadsheet file; define auto-backups?